My friend Heather, of garlic oil on a pizza fame, knows her way around good food. No, she doesn't cook it much--her spouse does--but she sure has great ideas for what goes well together. She was raving about her leftovers for lunch and the combination sounded so good I had to try it. 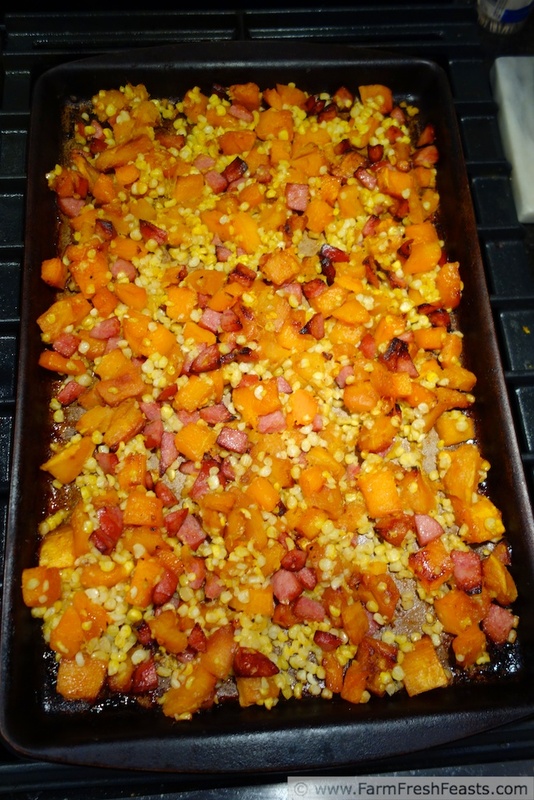 Heather's lunch was loosely patterned after Ina Garten's Caramelized Butternut Squash, but her spouse added canned corn to pump up the veggies. Heather combined another leftover and cheese on top for her leftover remix. I'm a gardener who has helped teach elementary school aged kids about gardening, so when I hear "squash and corn" I immediately think of a Three Sisters garden. Native Americans would companion plant squash, beans, and corn together--known as the Three Sisters. The Three Sisters helped each other: the corn would provide the scaffolding for the beans to climb and the squash would spread around the base, shading the soil, holding in the moisture, and preventing weeds. When it works, it's a thing of beauty. I had both acorn and butternut squash, as well as some corn I'd put up [boil briefly aka blanch, cut off the cob, spread on a tray to freeze, and store in a bag], so I figured 2 out of 3 I'll call it Two Sisters. I wanted to add bit more protein, however, so I chopped up a piece of smoked sausage. Now it's more like Two Sisters--and a Brother? I've been busy canning lately (you can see the results on my FB page) so an easy filling recipe like this is wonderful for cool nights. And Heather's right--the leftovers are terrific! Preheat oven to 400 degrees Fahrenheit. Peel (oy!) and cube squash into bite-sized one inch cubes. Combine butter and seasonings in a large bowl. Stir squash in butter until thoroughly coated. Spread in a single layer on a rimmed baking sheet. I used my stoneware bar pan (a metal pan may have a faster cooking time). Bake for 30 minutes, stir. Bake another 15 minutes, stir. 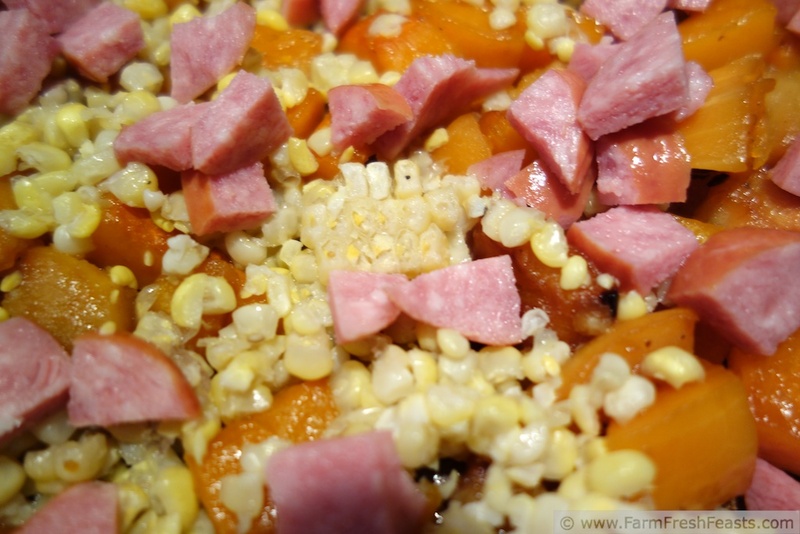 Add corn and sausage on top. Bake 10 minutes, stir. Continue baking until edges start to brown (for me that was 5 more minutes for a total baking time of 1 hour). Serve with a sprinkling of cheese if desired. Have you ever successfully planted a Three Sisters garden? This post is shared with the Clever Chicks Blog Hop (happy 1 yr Hopaversary! ), Tasty Tuesdays, Wednesday Fresh Foods Link Up, What's Cookin' Wednesday, What's In The Box, From The Farm Blog Hop. 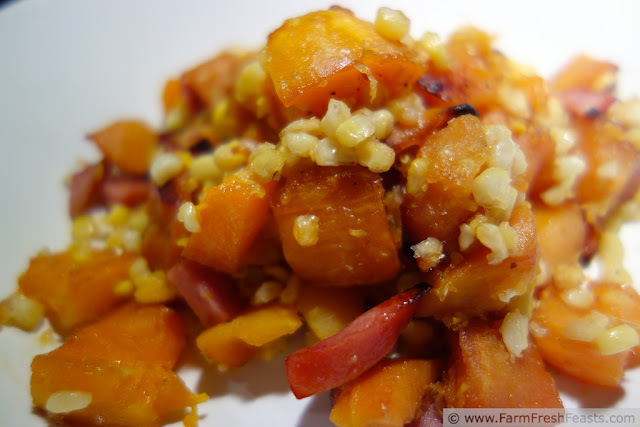 I need to break out of my roasted squash rut. This looks like just the ticket! Thanks for the recipe! BTW, beautiful pics, especially the top one! 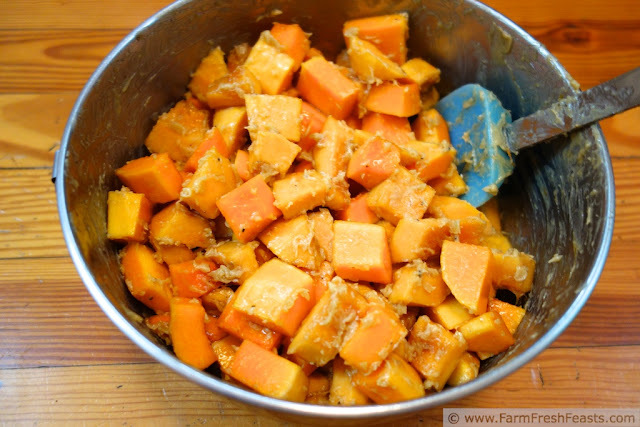 This is a really tasty way to enjoy squash--though the peeling/cubing part is sort of a pain. You should put this on a pizza. I almost made a three sister dish a couple of weeks ago, but went another route at the last minute instead. Come to think of it, I don't even remember what I made, but the veggies got used nonetheless. I haven't gotten a squash in my CSA yet, but I know they're coming. Last year was really my first year getting squashy with my produce so hopefully this year I'll get a little more creative. My CSA folks are holding onto their winter squash I think, because I've harvested several from my garden already. Tree Squash, which may be a pumpkin, is going to fall out of the tree soon (and therefore be harvested). This would be good on a pizza--I really liked that roasted root veggie pizza with you (though I missed cheese and would not make mine a vegan pizza) so I'm planning some this fall. 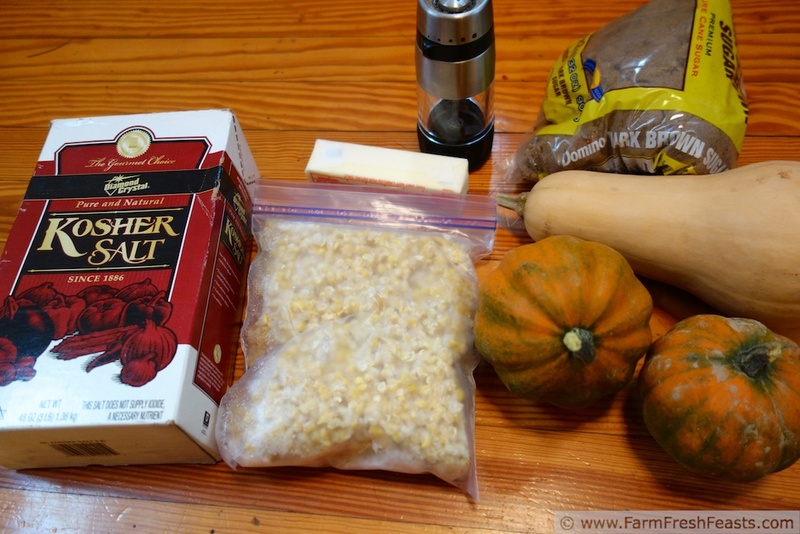 Hopefully the weather will be conducive to roasting when you get your winter squash! When it's in the 80s all of a sudden roasting squash seems like a silly thing to do. I love everything about this "two sisters" dish, especially the addition of some smoked sausage to add a salty component. Thank you. The flavors work really well on this one. This sounds SO fantastic! I'm hoping that our CSA has squash this week when I pick it up tomorrow!! If your CSA doesn't have winter squash this week, it soon will. (Though I see my zucchini has been revived by the rain and there are 2 baby squashes waiting to turn into baseball bats when I look away, so perhaps summer squash season isn't quite over yet. Agreed on all points. I also like how this reheats well, so I'm thinking it may work as a new Thanksgiving make ahead side dish. Love summer sausage but never knew what else to do with it besides slice it and slap on a little mustard :) This sounds so great and maybe will inspire a little fall weather our way! I really wish the Power of Blogging would inspire the weather. Doesn't seem to around here, though--it's still hot when I wish it would cool down, and stubbornly cold when I'm ready for a hint of Spring. I love the season of squash, too, Heather. Of course I love the season of strawberries, and the season of tomatoes, and and and . . .